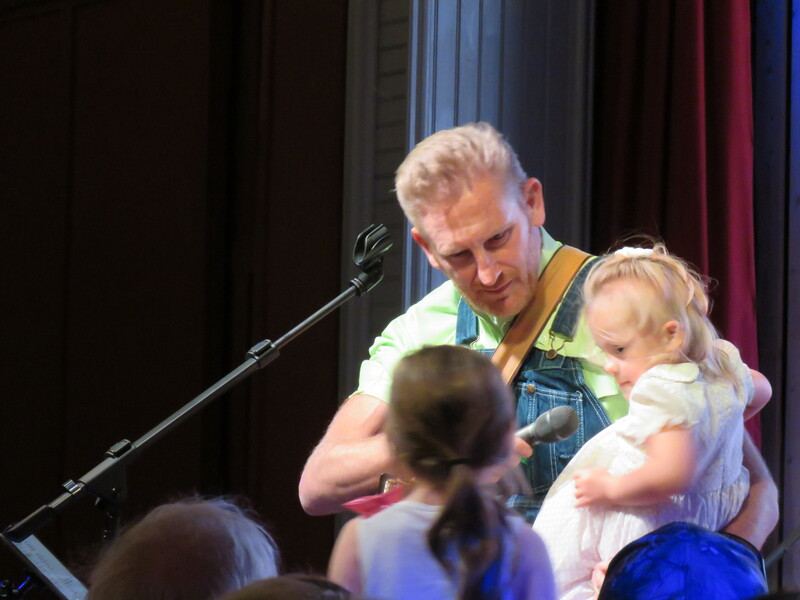 It was probably about four years ago that I became aware of Joey and Rory Feek; delightful country and gospel music singers who were starting to cause sensations on the national scene with their music. After the birth of their daughter, Indiana, Joey received the devastating diagnosis of cancer. She fought valiantly for about two years but one spring evening in March 2016, Joey slipped away to her heavenly home. Rory was not only a song writer and composer but also an amazing blogger who shared with the world their powerful love story; a story of faith, hope, promise, broken and fulfilled dreams and life. Millions of us fell in love with this hometown Tennessee couple by watching their TV show and reading his blog, “This Life I Live”. After Joey’s death, Rory said he would never sing or write songs again. 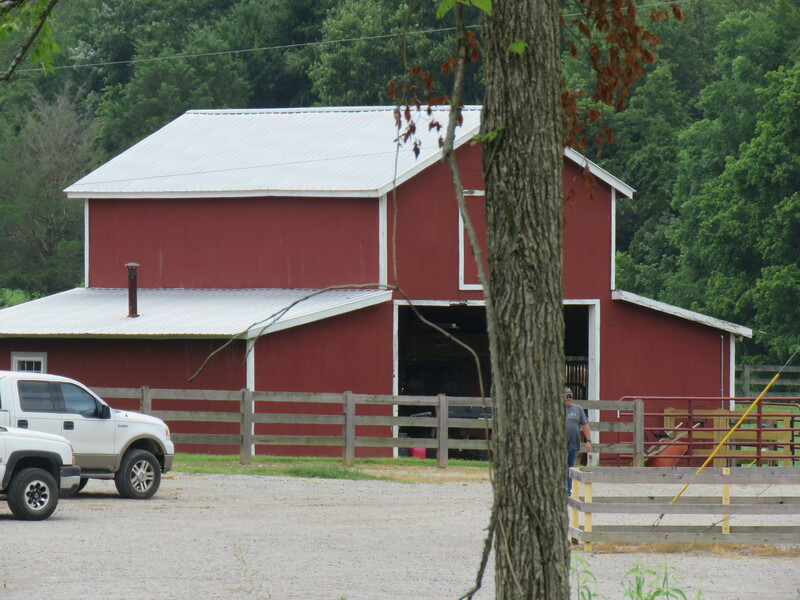 But God is healing his broken heart and once again he has started having concerts on his farm in the “barn” converted into a concert hall. He shared with us Saturday night that he is very close to writing songs again. 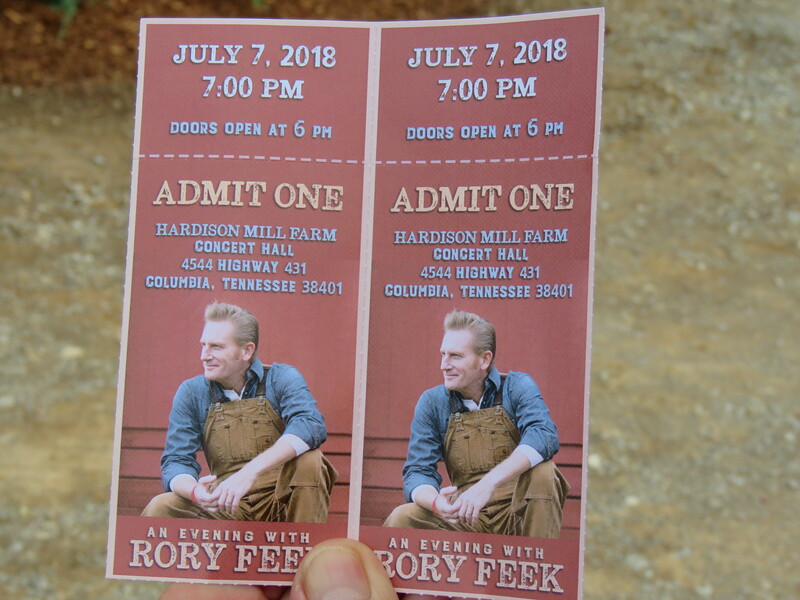 When we heard Rory was having concerts on the farm in Hardison Mill, Tennessee, we decided we wanted to go. Vacations are always good, but some go down as “extra special”. Let me tell you, this one was extra, extra special. Tops! 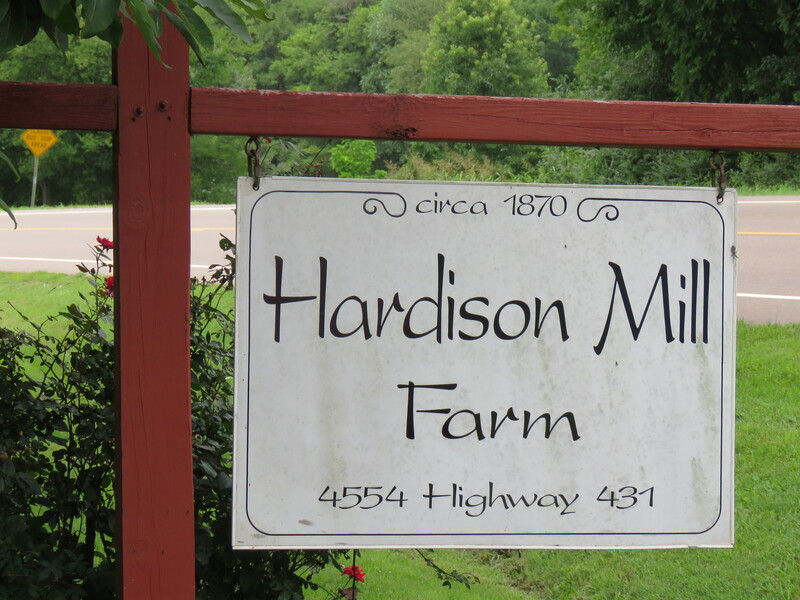 Hardison Mill is south of Nashville and about five miles from Columbia. It is such a small little berg that it didn’t even make it on our map, although GPS knew how to navigate us there! It was a ten hour drive plus stops. We drove half-way Friday night and the rest on Saturday, allowing us to arrive at noon for the 7 PM concert. 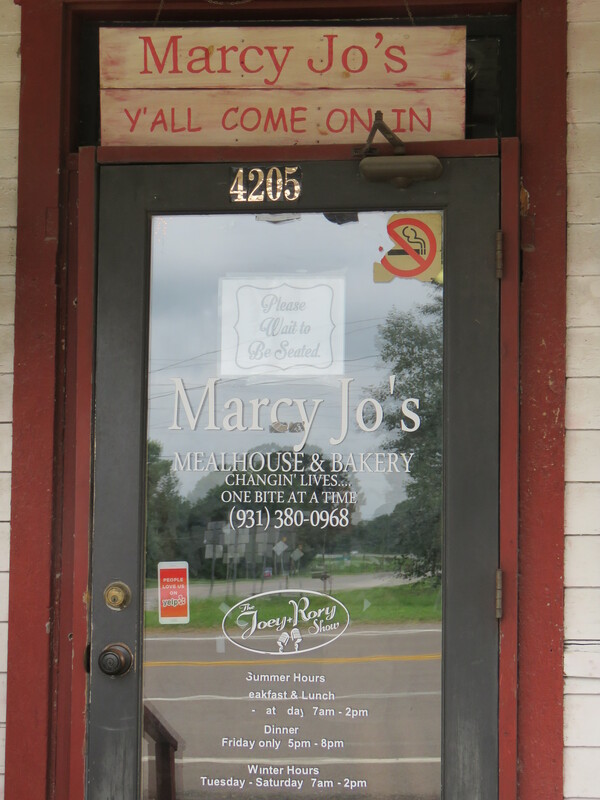 We decided to look up Marcy Jo’s restaurant for lunch. 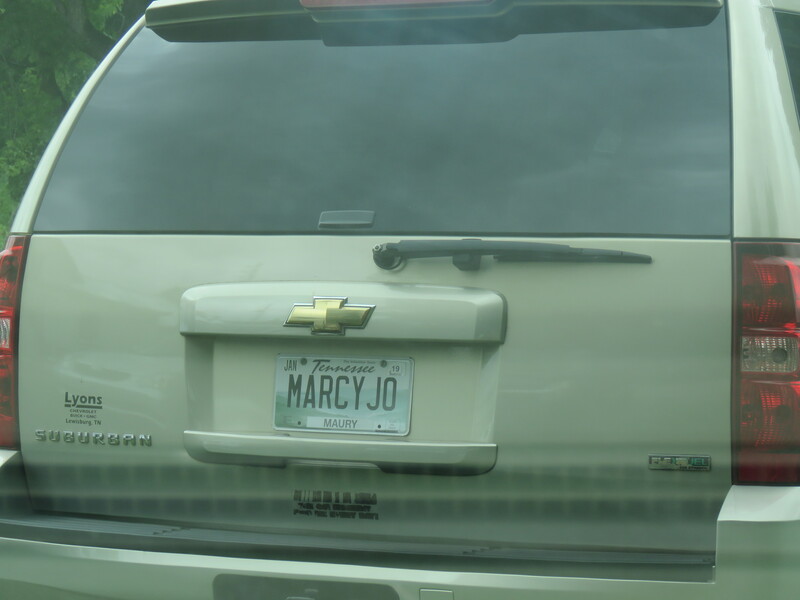 Marcy is Rory’s sister. The Jo in the name is for Joey. She and Joey worked together for nine years. 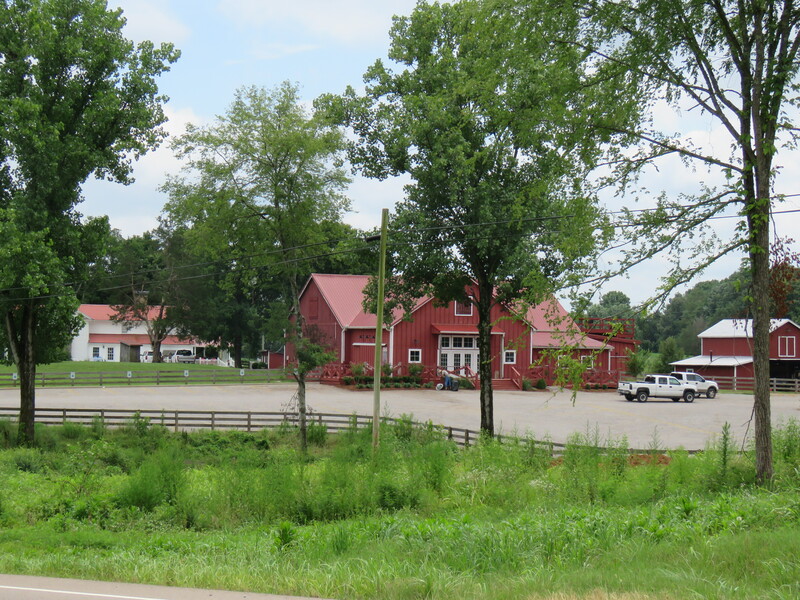 It turned out that the restaurant was about 2 miles from the farm. We were in for a total surprise. 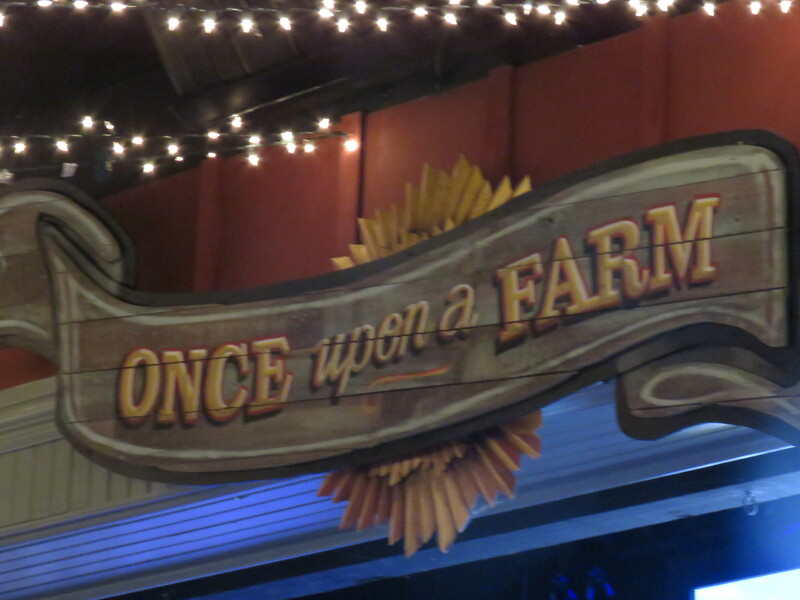 This quaint, rustic, little restaurant was a step-back into time. Built in 1891 (I believe they said), it is still the old, weathered store it used to be with a history to tell. 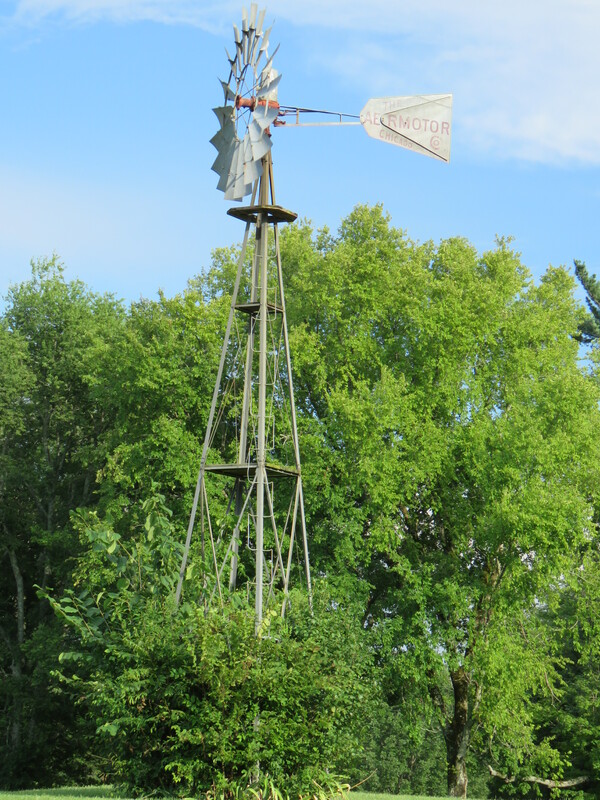 It sits a few feet off the road at a very busy intersection, the corner of 431 and 99, the road to Columbia. 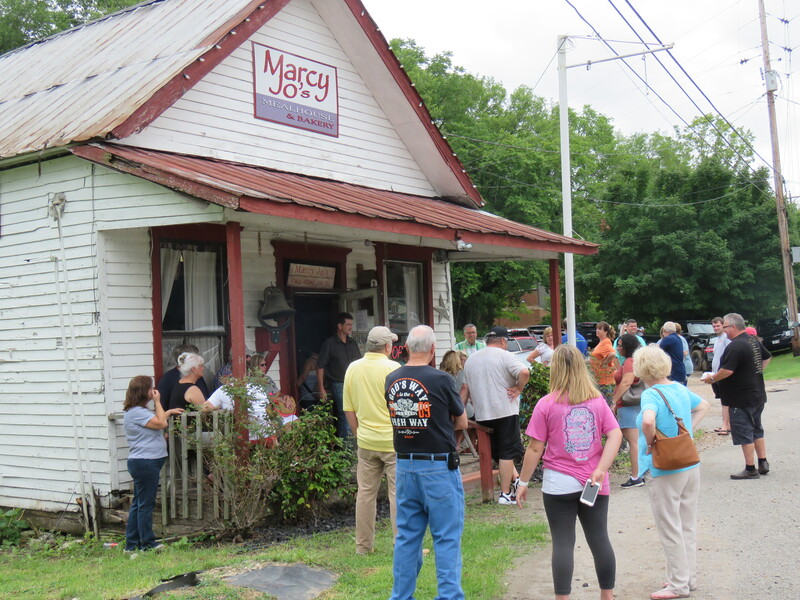 The place was overflowing with people waiting to have the experience of eating at the now famous Marcy Jo’s! We had to wait one hour to get our genuine home-cooked meal. The bustling place is very small with friendly waitresses and seats about forty. Upstairs is a shopping area filled with jewelry and antiques. 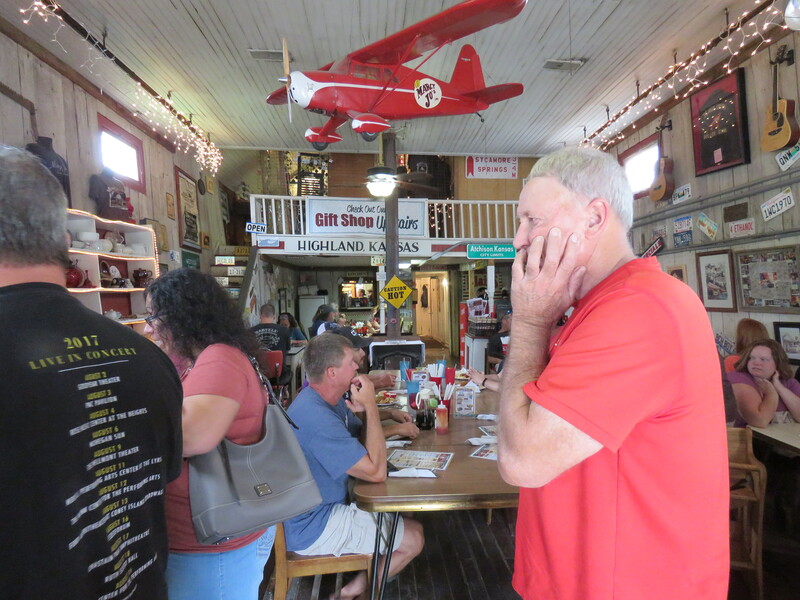 The walls are covered with antiques and pictures and the shelving behind the counter is filled with Marcy Jo’s cookbooks, Rory and Joey’s CD’s and books, T-shirts, local honey and glassware for sale. An old potbelly stove sits in the middle at the back. 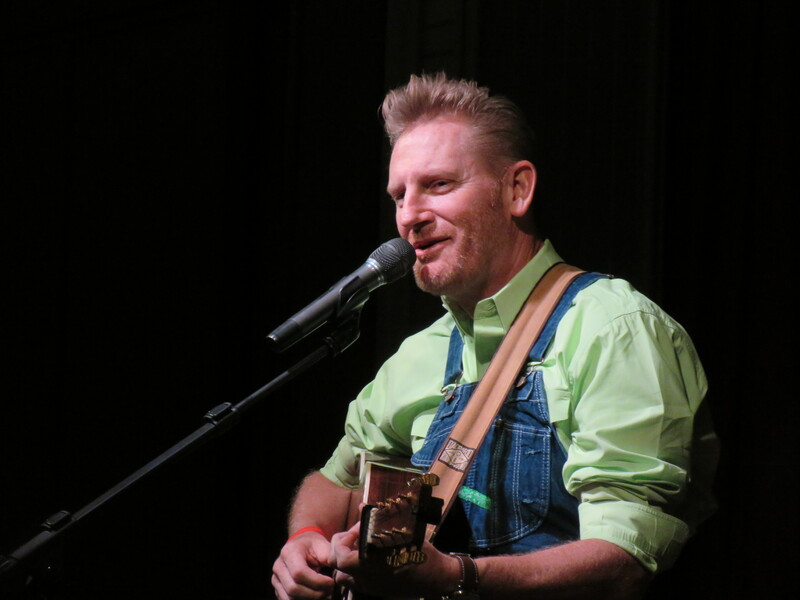 I saw a picture of Joey and Rory hanging on the wall that was taken in the store. It appeared that I may have been sitting in the very spot she sat. The place was full of Joey essence and you almost expected her to come through the door. 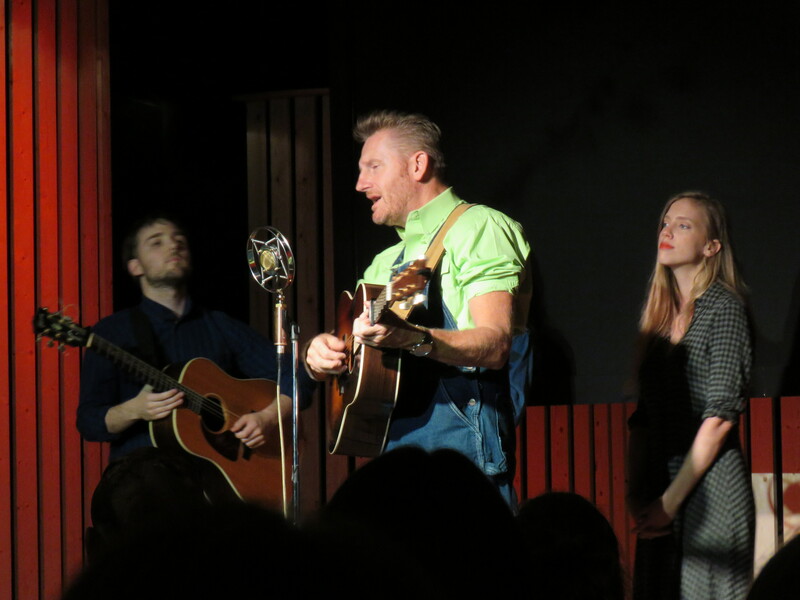 Joey and Rory were ordinary country folks, living and working in rural hometown USA with big dreams. Using their God-given talents of music and blogging, they won their way into our hearts and have become loved and esteemed all over the world. A very magical thing happened at the restaurant. Suddenly time slowed to a grinding halt. We were truly on vacation and no longer in a hurry to get someplace. 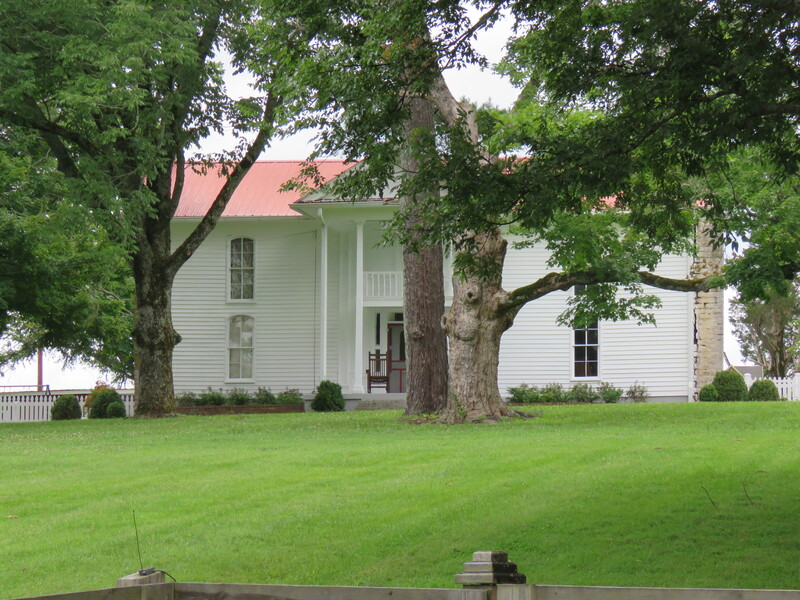 As we sat on a bench on the porch with the group hanging around waiting for our turn to go inside, I realized we were all strangers chatting together as if neighbors gathered at the local store. “Where are you from? 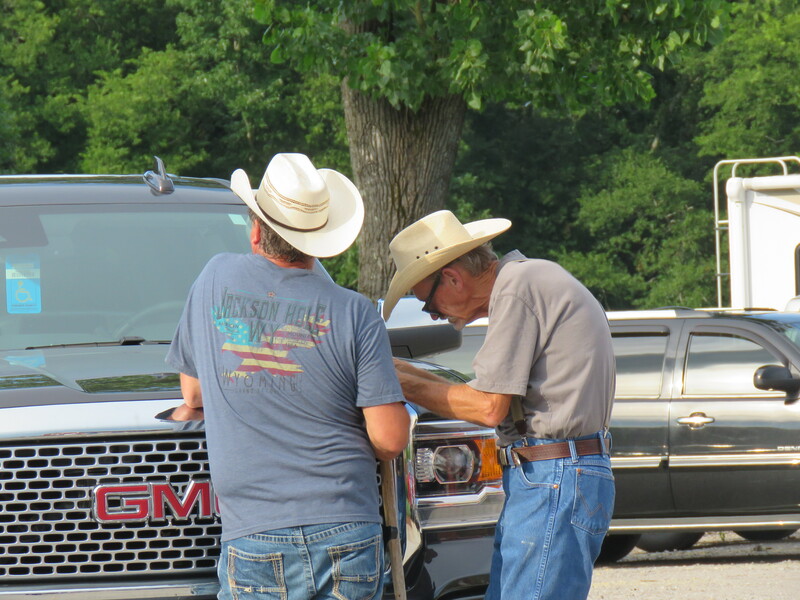 Are you here for the concert?” For an hour we chatted with people from Indiana, Pennsylvania, Memphis, St. Louis and Mechanicsville, VA, which is in the area of our hometown. We talked mostly about Rory and Joey and the specialness of this spot. 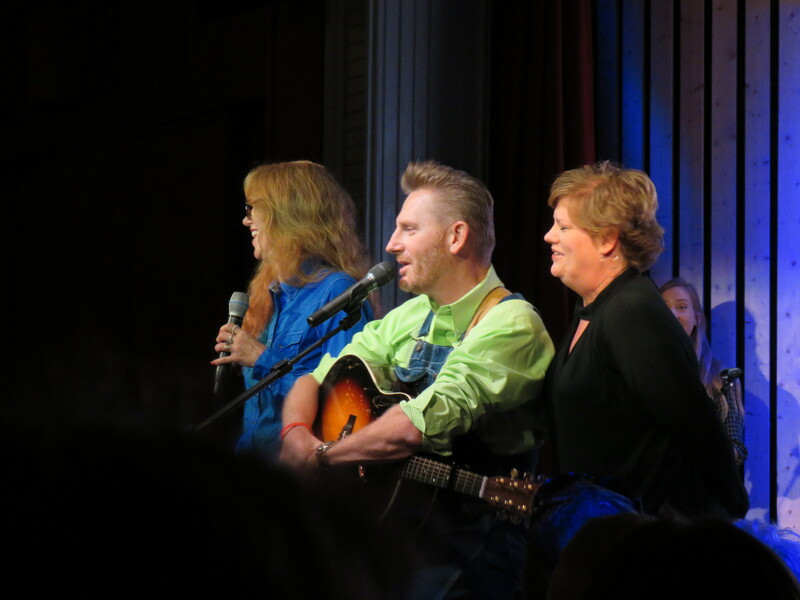 It was special because though we were strangers, we had a common bond, we had been invited into the intimate lives of Joey and Rory’s through their writing and music. All of us at the restaurant were probably tourists, there for the concert or passing through. The locals drove by, honked their horns and gaily waved, welcoming us. You only honk at people you know, right? They knew why we were there and also knew better than to eat there on concert day! Inside we were seated at the “family” table in the center with about eight other people. Seated beside us were two girls from St. Louis. The one’s name was Jill, making it very easy for us to remember! We enjoyed our time chatting with them. 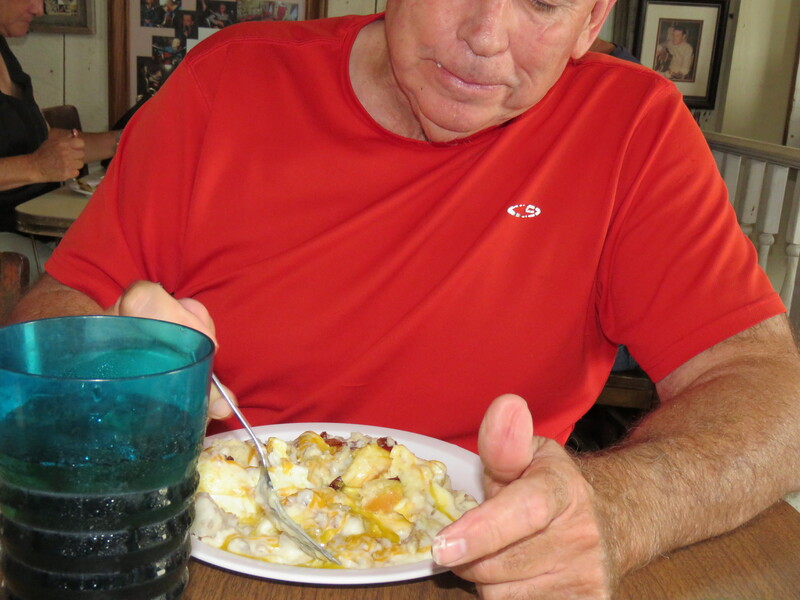 Gene ordered “Rory’s Overall Breakfast,” advertised as Rory’s favorite entree of Angel Flake biscuits, sausage gravy and easy-over eggs, topped with shredded cheese. 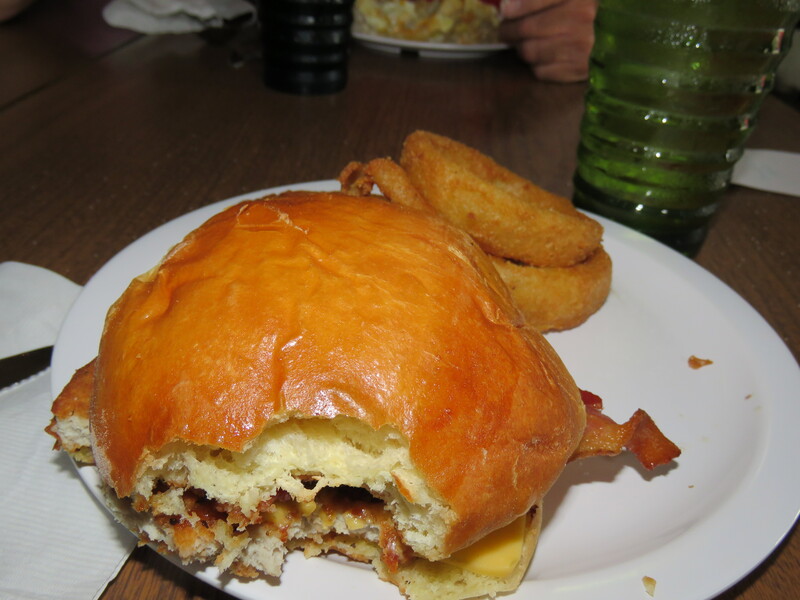 I ordered the “Boss Hog”, a tender, grilled tenderloin with bacon, barbecue sauce, and cheese on a homemade bun with onion rings. It was a delicious meal. Filling the seats and waiting for the show to begin. 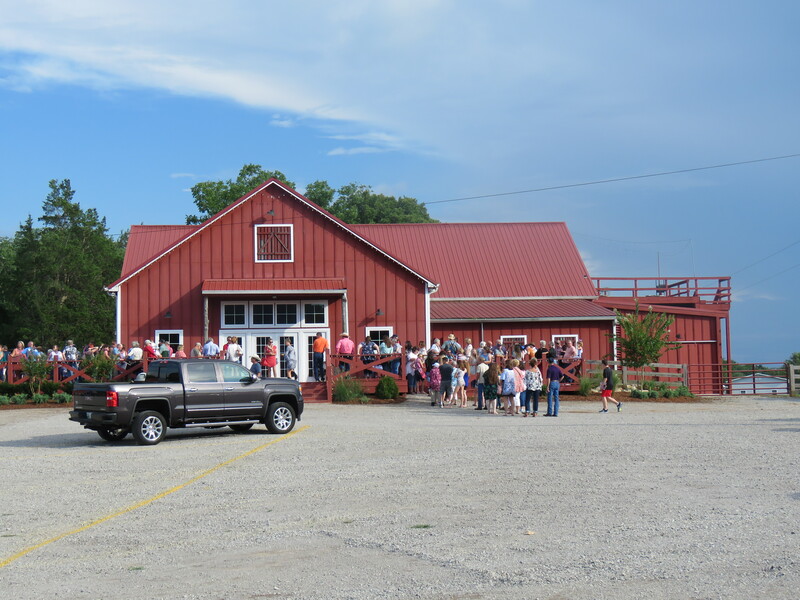 The barn holds 300 people and it was a sold-out crowd. We had the neat privilege of sitting beside one of Joey’s childhood friends from Indiana who was there for the show. She told us stories and pointed out family and friends of the Feeks. 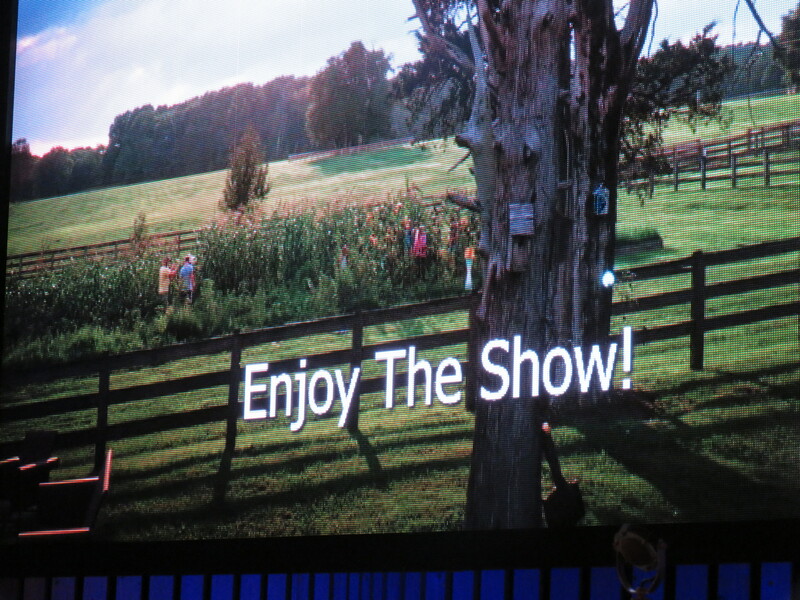 The big screen said, “Enjoy the Show!” For the next 3 hours we did. Usually the show last 1-1/2 hours but somehow this evening, time slipped by and apparently Rory also lost track of time and we were treated to double time! The evening was a mixture of story telling, music and entertainment. Rory’s oldest daughter, Heidi, also sang, and her boyfriend, Dillion, played guitar. Indy was brought on stage for a short visit and a little girl from the audience gave her a card she made. Rory called his two sisters to the stage and introduced them. Marcy is on the left and Candy is on the right. He asked a pastor in the audience to pray for the evening and especially Candy, as she is fighting cancer. 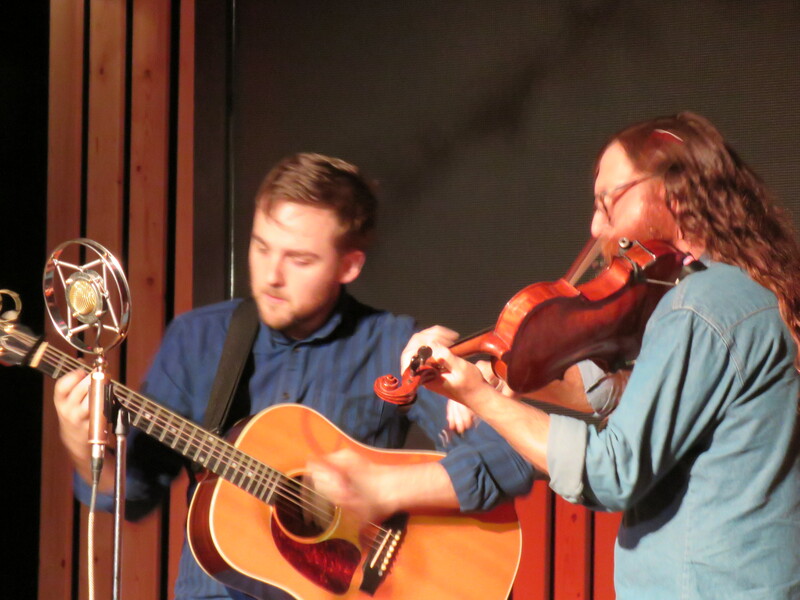 A professional fiddle playing friend of Rory’s whose first name was Daniel was in the audience. After the intermission, they got him on stage for an amazing instrumental hoe-down with Dillion. 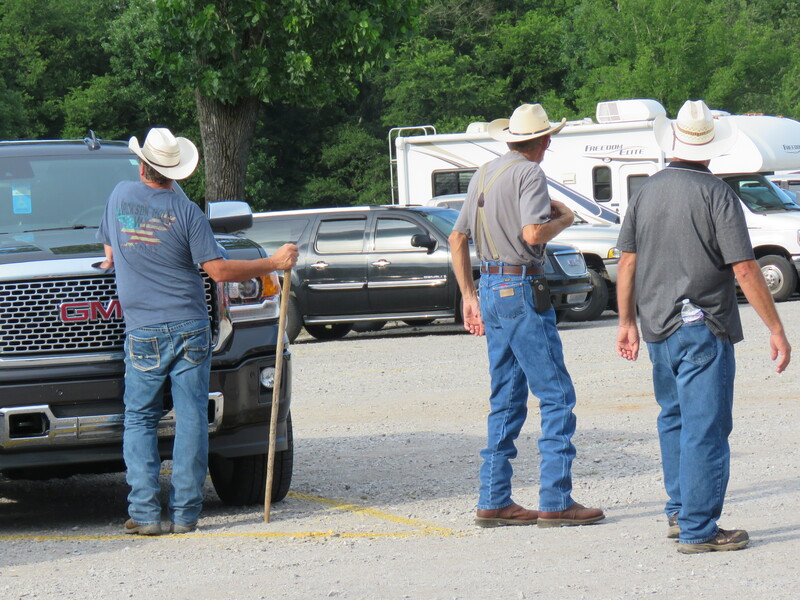 Friendly cowboys friends showing us where to park. 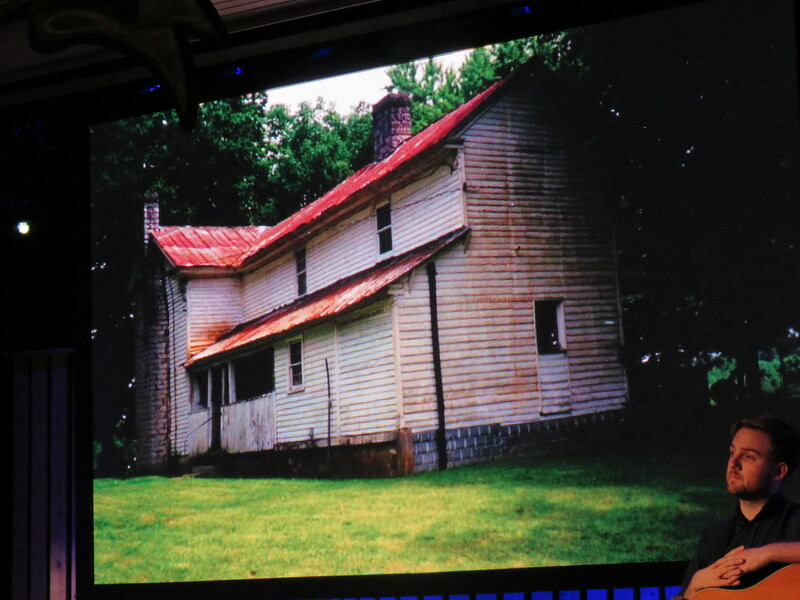 This was a picture Rory showed of the house when he bought the farm in 1999. It was a fascinating story. Indiana is a special needs child with Downs Syndrome. 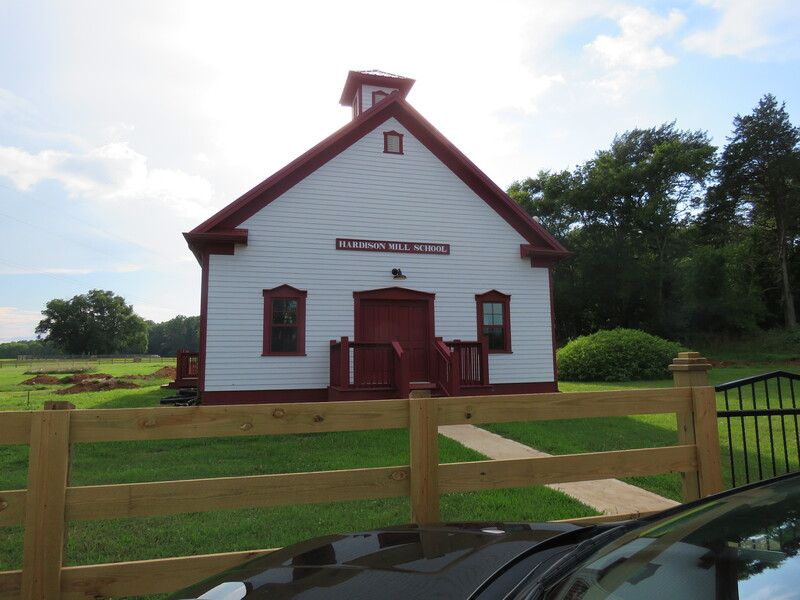 He just finished builting the schoolhouse for her with money that came as love gifts after Joey’s death. The school, opening this fall, will be for Indy, along with a selected number of other special needs children. We were not allowed to roam the farm but oh how I wanted to!!! I took some pictures from the concert hall area. 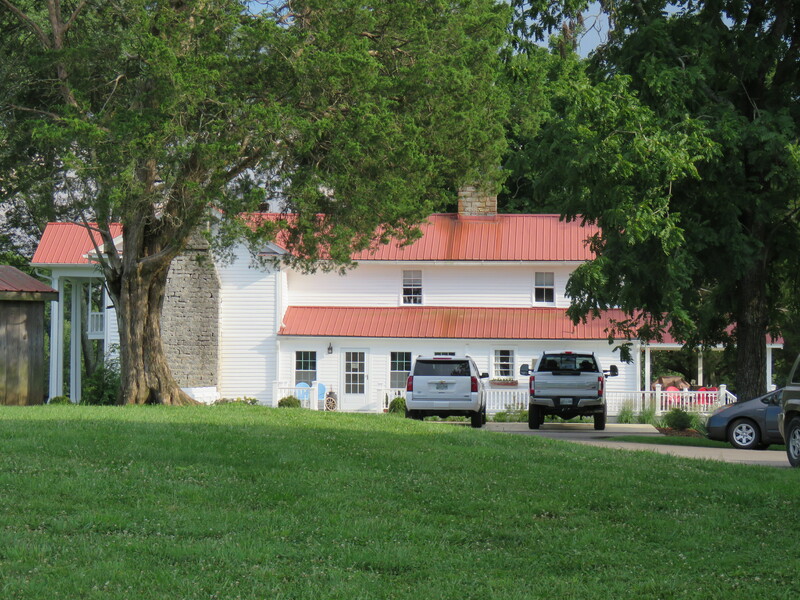 It was a beautiful, picture perfect, manicured farm. 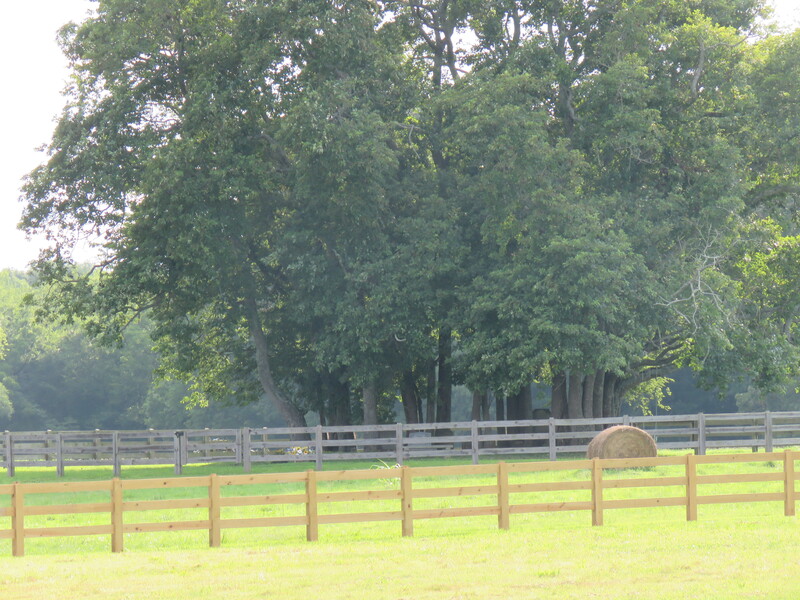 I saw the grove of trees across the field with the fence around it and I knew. I knew this was “the spot”, the resting place of Joey, her mother, and the previous owners of the farm. Rory’s bench beckoned me but this was his personal, private spot and it is not open to the public, so we stood at a distance and gazed, to pay our respects. 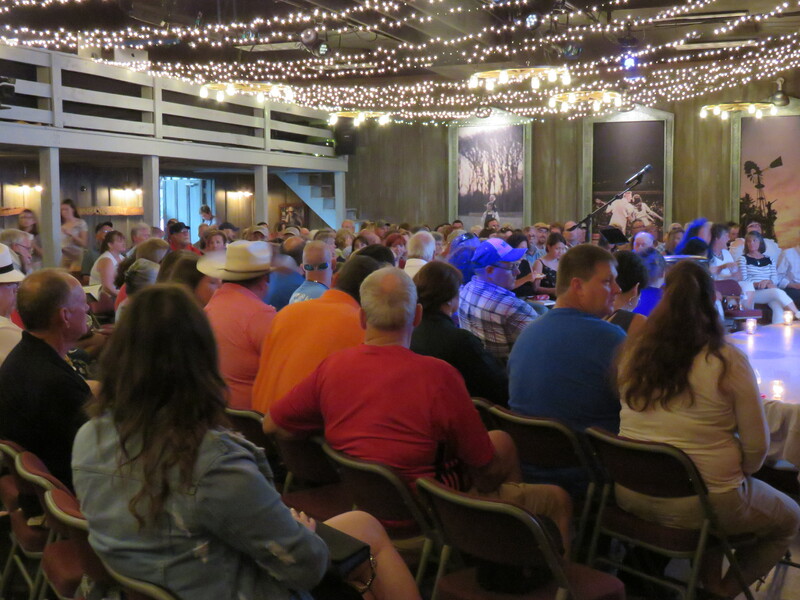 The concert hall is also used on Sunday mornings for “Cowboy Church”. They have two services, 9:00 and 10:30 a.m. (if I remember correctly). We would loved to have attended but with our 10-hour plus drive home we just couldn’t make it work. This picture I had to take. 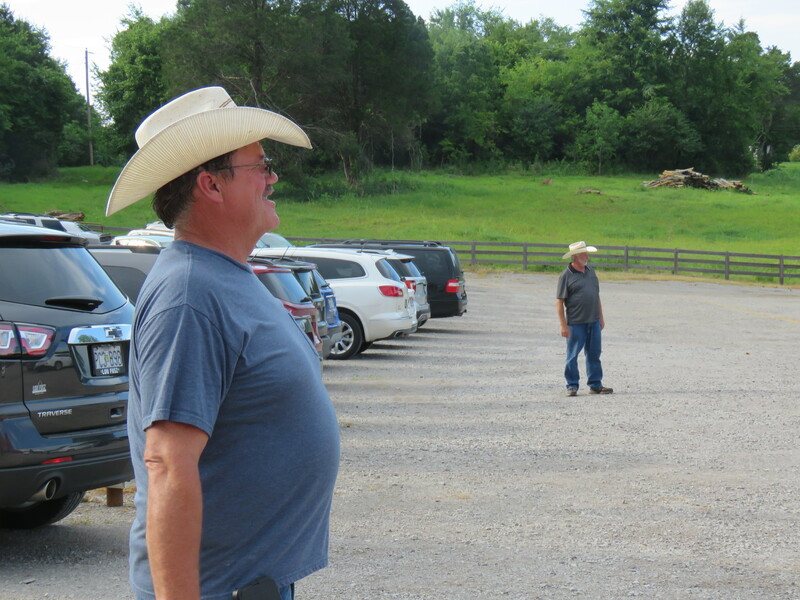 It was in the concert hall and really made us smile as we have sold Purina feed in our store for 35 years and fed it for years and years before that! 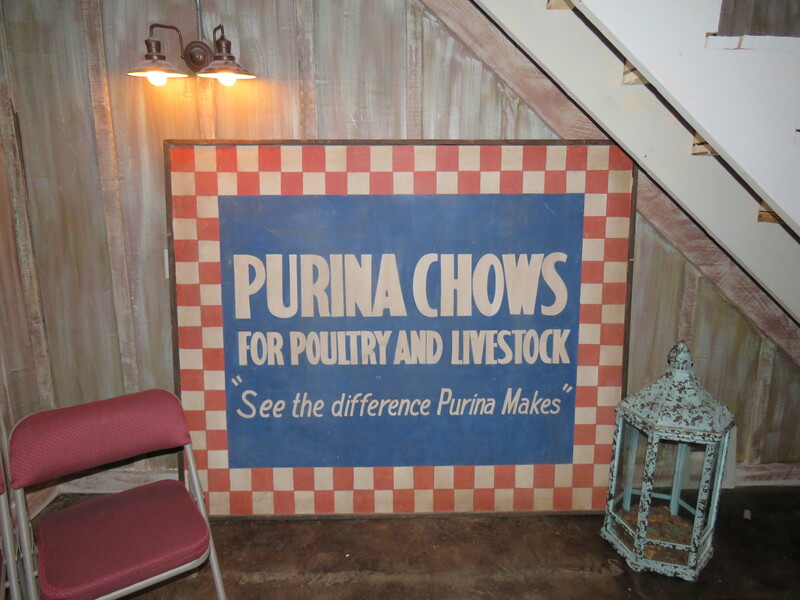 For loyal Purina dealers this antique sign was a added bonus. 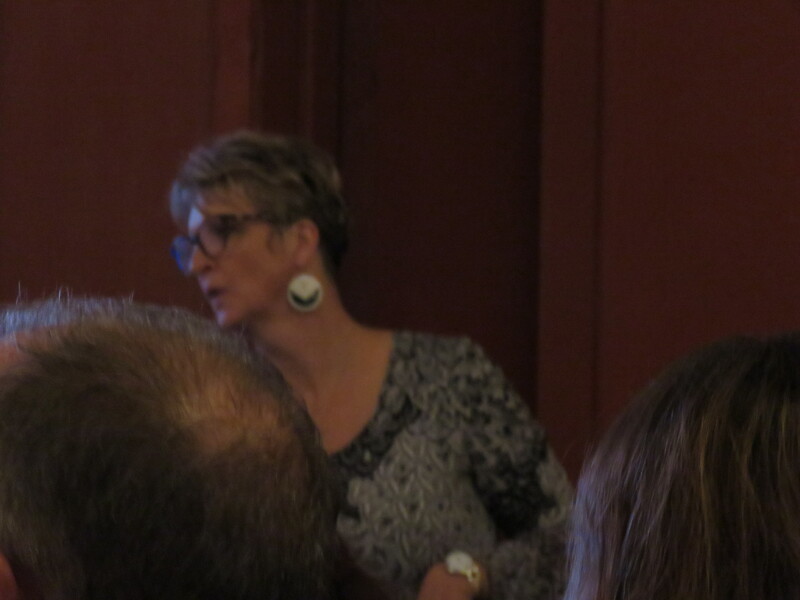 A picture of Julie, who was Joey’s best friend, is still involved with the family and all their doings. We happened to be sitting next to a couple at the concert who are long-time family friends and they pointed out numerous special people to us. 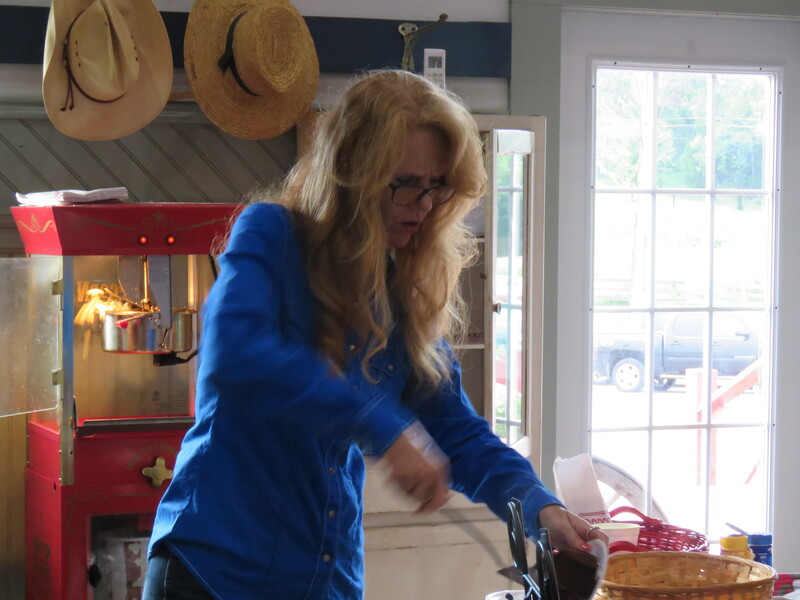 Marcy brings and sells slices of her signature cakes at the concerts; a luscious chocolate called Cola Cola Cake, Elvis Cake, and Heath Bar Cake, to name a few. I wanted a signed copy of Rory’s two books; ” This Life I Live” and “Once Upon a Farm”. When I purchased the books, I asked if they were signed and the guy at the counter said no, but after the show Rory would sign the books. When the show was over we were on the wrong side of the room and it was late and I think half the crowd was in the line. I decided to forgo the wait. When I got home and opened my books, to my surprise and delight they were already signed. I just didn’t get to shake his hand and thank him. You can go to Rory’s website for more information about his blog, books, cd’s, the movie about their life and schedule for the concerts. It was a wonderful evening and one I will remember for a long time. Tops!